350 Perth – Why aren’t we alarmed? When talking to people about climate change and when listening to politicians talk about the issue, I get the distinct impression they think we have a lot of time. The sense of urgency is not there, and people do not easily understand why I feel such urgency. I will try to explain from a historical perspective why I think we are already 27 years late in acting on climate change, and need to act urgently. Over the last 600,000 years CO2 concentration in the atmosphere has cycled between 180 and 300 parts per million (ppm) and in the year 1750 it was 280ppm. As the Industrial Age got into gear it slowly increased. When I was born in 1961 the CO2 concentration level was 317ppm. It then started accelerating. The 350ppm mark, which 350.org gets its name from, was passed in 1988, about the time the IPCC was formed and the first major global report on climate change was being written. The world started talking about acting, the science was strong, the planet was changing. The then Australian Prime Minister Bob Hawke in October 1990 established an interim emissions reduction target of 20% below 1988 levels by 2005. Science and common sense ruled. Then it all fell apart and 27 years later our annual emissions are virtually the same as they were in 1988. Latest global CO2 concentrations are 405ppm, over 40% higher than in 1750. So since I was born 56 years ago, what has the effect been? 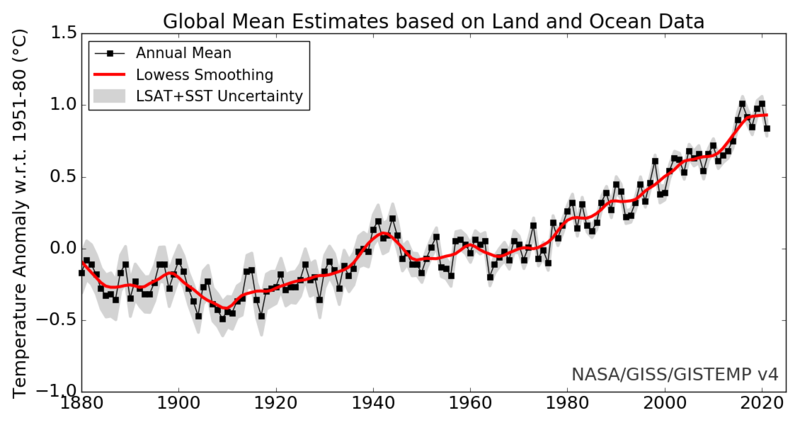 Firstly the global temperature has increased by about 1 degree Celsius. To put that in context, the difference between a glacial period with several km of ice above Montreal and now is about 6 degrees globally. Roughly 50% of Arctic sea ice during the yearly Arctic minimum is gone. Sea level is rising twice as fast as the 20th century average and four times as fast in Perth with a threefold increase in recorded flooding in Fremantle. Five ice shelves have collapsed in West Antarctica, not a biggy on its own as ice shelves are in water so sea levels do not rise, but they hold back glaciers that are now sliding faster into the ocean. There is 5m of sea level rise worth of ice just on this tiny peninsula. Around 90% of glaciers are retreating and losing about 150 billion tons of ice each year. Glaciers store about 75% of the world’s fresh water. Our oceans are warming and have become 28% more acidic by absorbing half of the extra CO2. This has culminated in three global bleaching events on the record, all of them in the last twenty years and, getting closer together. Our own Great Barrier Reef over my lifetime has lost 50% of its coral and 93% of the reefs saw bleaching last year. Coral can recover, as long as the ocean cools enough and there is a big enough gap between bleachings. Around 22% of last year’s bleached coral is not expected to recover and will die. Recent reports say the reef is bleaching again; back to back bleaching is unprecedented. Bushfire season globally is now 19% longer and extreme weather is five times more likely. In Australia record breaking hot days are beating cold ones 12 to 1 and there has been a 30% increase in heatwaves in Perth. Rainfall in WA’s southwest has declined by 15%. What is hidden by these statistics are the pain and suffering and costs already occurring, which are considerable. This is just a sample of the changes that are occurring after JUST 1 DEGREE OF WARMING. Most of these changes have occurred fairly recently and are accelerating. That’s because, as a planet, Earth takes a while to get going and will take a while to slow down. So now factor in that even if we STOP EMITTING TOMORROW, we will keep on warming for around 20 years. Carbon budget calculations on how much we can emit show that to have a 66% chance of staying under the 1.5 degree aspirational Paris target we have about a year and a half left TOTAL. We already have enough carbon in currently producing coal mines, oil fields and gas wells to pass the 2 degree target, and about 80% too much when you take reserves into account. But we are still opening new coal mines and exploring for new gas. This is despite the fact that we have a solution – renewables: clean, ready, and in most cases already cheaper than fossil fuels for new installations. Every report I have seen on transitioning to renewable energy in WA says it can be done in 13 to 15 years at little to no extra cost than sticking to fossil fuels, and with a net increase in jobs and manufacturing industries. A stunning presentation I saw by Michael Lord from Beyond Zero emissions showed that WA has the renewable potential to supply 9% of the world’s power just by taking into account areas near transmission grids. That could open up export industries in the creation and supply of zero emission hydrogen fuel and steel. Why would we NOT do it? But we are not only NOT doing it, we are going backwards – emissions are RISING in Australia. Why? Polluted Politics. No better example exists of the sorry state of Australian politics than this Federal government’s shenanigans. While record breaking heatwaves spread across the East Coast and unseasonal wet weather was destroying grapes in WA’s Swan Valley, our federal treasurer brought a lump of coal into Parliament and laughed at the Opposition for being afraid of it; the government even tried to argue for using renewable energy funding for only slightly less dirty new coal power plants. Every blackout in South Australia was being blamed on renewables and the Labor Party is constantly attacked for its ‘unrealistic’ modest 50% target yet most reports say we could get to 100% renewable energy by 2030. But instead of fighting back, calling out the lies and standing up for renewables to combat climate change, the Labor Party, both State and federal, generally tries to present a small target for increases in renewable energy. During the WA State election Labor leader Mark McGowan, when faced with an attack on renewables, declared there would not be a renewable energy target under his government. Words matter and what those words do is reinforce the lie that renewables are unready and unreliable, and ignore the consequences of climate change. This is an everyone and everything issue and we all need to stand together in demanding better from our leaders.